I love Sparkling Ice water! It’s always been one of my favorite drinks. It’s not just the fabulous flavors they offer or the fizz. The fact they have antioxidants, vitamins and those fabulous flavors are actually natural, are reasons to get excited about Sparkling Ice water. This summer entertain your tastebuds and others with a sparkling fruity mystery cocktail! At your next get together or summer party add this to the menu. 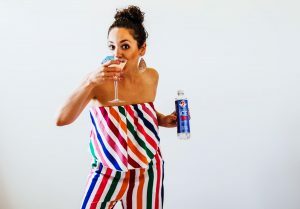 Let everyone try out some of the Sparkling Ice Mystery flavor while you whip up some cocktails. It’s a great conversation starter as everyone tries to guess the new fruity mystery flavor. It’s so fun seeing everyone guessing and discussing what flavor they think it is and why. Maybe even poll the group and see if there is a majority consensus on the flavor. 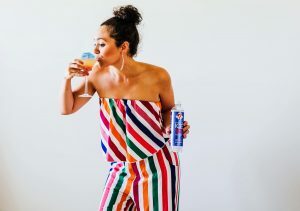 Ready to try this Sparkling Fruity Mystery Cocktail? Pour all ingredients into a glass with two pieces of ice and stir. Remove Ice and pour into a martini glass. I garnishes with 2 maraschino cherries. 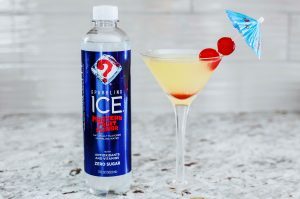 Have you tried the new Sparkling Ice Mystery Flavor? 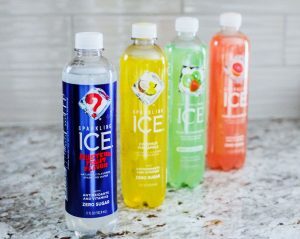 Do you have a favorite flavor of Sparkling Ice water? I don’t think I can pick just one, buuuutttt if I had to, the coconut pineapple is awesome! It’s a little virgin piña colada that is packed full of antioxidants and vitamins. 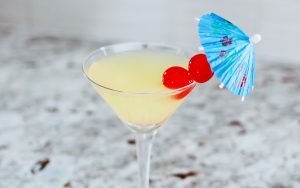 oh man, you’re making me want a cocktail so bad! This looks so good! These all look so great. I love those sparkling drinks! This looks like it would be perfect for the summer! We love those drinks! So good. I love the sparkling ice drinks! I love Sparking Ice! I need to try this flavor. You are too cute!! This looks refreshing but I’ll have to pretend for now. Lol. I bet the Sparkling Ice is good by itself too though! this looks amazing girl! i def need to try it!